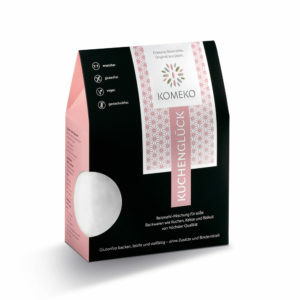 Gluten-free baking is easier than ever with the three KOMEKO rice flour blends. In most recipes, they can be used 1:1 instead of wheat flour and do not require any binders or additives for an easy-to-handle dough. This distinguishes them from all other common rice flours and makes them an excellent alternative to wheat or other glutenous flours. Although KOMEKO is made from 100% rice and naturally contains no traces of gluten, it has a special stickiness that is necessary for baking. The selection of the different Japanese rice varieties, their mixing ratio and the degree of grinding are decisive for the baking properties of the three unique flours. Whether bread, pizza, biscuits, stirred cake or whatever! – KOMEKO has the fitting flour for all needs. puff pastry, tarte flambée & wraps. bread, bread rolls & pizza dough.